Weight training for women has never been easy. Getting the right amount of muscle mass alongside clear definition is a major desire, but the truth is, there’s so much more to weightlifting than meets the eye. Beside the right nutrition, you will need those exact machines that help you tone and build the muscle groups you're after. To make things easier for you, we've reviewed five machines that you can add to your home gym for the best results. Enjoy! The complex, multi-functional home gym systems have always been built and advertised as a sure-fire way to bulk up and look your best. However, many of these products seem tailor-made for men—with high capacities and a rugged design that aim to improve a muscles size, but not the definition. It’s no secret that the majority of men and women tend to look for different results from their time in the gym. And while there are exceptions to every rule and certainly no man or woman is the same, it’s worth acknowledging that there are simply different biological components to keep in mind when it comes to working out and looking our best. Whether you’re hoping to tone up for personal reasons or are preparing for the summer season, muscle building, definition, and overall strength is primarily going to come from your time spent with weight lifting machines. It’s also becoming increasingly cost-effective to keep your workouts at home either using a total workout machine or another specific device. No matter what you’re looking for, we’ve gathered the top five best at home machines catered specifically to weight lifting for women. We’ve also broken down what you need to look for in a machine before purchasing the product, as well as a few tips and trick we think you need to know about machines in our Buyer’s Guide. Weight lifting for women can be a fun and rewarding experience, as well as provide a myriad of health benefits. You’ll need to look for certain traits from your at home machines that will best move alongside your goals. Would you like more muscle mass? Would you like more defined muscle mass? Would you like to improve endurance? Would you like to increase your flexibility? These questions will lead you from guesstimating what sort of machine you want to knowing the right machine for your fitness goals. Looking to simply increase muscle mass? You’ll need a machine that grants a serious amount of weight behind it, without forcing you to overexert yourself. Generally speaking, if you aim for low repetitions with a heavier total weight, you’ll build muscle a lot faster than you will define it. This also means that you’ll need to ensure that your diet adjusts accordingly, but we’ll be getting more into that a little bit later on. Increasing muscle mass overall is one thing, but if you already have the strength but lack the definition, you may want to aim for a lower total weight but with more repetitions. This allows muscle groups to continue to hone in their ability to lift a certain amount of weight and increases tone. Defining muscle is often more difficult than bulking up, but the results have to quite literally be seen to be believed. However, no matter how much you define your muscles, that won’t convey outside of the body if there’s too much body fat in the way of things. Which is precisely why you need to ensure you’re at a healthy body weight before attempting to define muscle. Losing weight is a complex subject that needs another article to dissect. However, what we can tell you is that losing weight is all about taking in fewer calories than the body uses, and forcing the body to burn fat instead of waiting for the next meal instead. There are many different ways to lose weight—from simple calorie counting to ketogenic diets and lots and lots of exercise. And while some suggest different methods than others, what’s important is that you lose the weight, stabilize at a healthy body weight, and do so in a way that does not deprive you of essential vitamins and nutrients. But when it comes to weight loss and weight training, you’ll want to use weights and bodyweight in a manner that challenges endurance and forces the heart to work hard and burn calories quickly. Certain fitness machines on our list are more effective at this than others, but generally speaking, we think machines that focus on time instead of repetitions, such as rowing machines or exercise bikes, are good for these purposes. Finally, endurance and flexibility are also sought after but are a bit more nebulous to train for when it comes to exercise machines. We recommend going for lots of repetitions and a considerable but constant amount of weight for endurance, and exercise routines with lots of motion for increased flexibility. You may also want to consider taking up running or Pilates to improve both aspects of your health. Based on the various goals and aspects of weight training as outlined above, we’ve chosen the top five machines that should greatly increase the efficacy of weight training for women. We think that any one of these five products could be the ticket to success for any woman —but that doesn’t necessarily mean that you can pick out the most affordable or best-rated product and expect immediate results. No matter what product you purchase, weight training and muscle definition are about hard work and determination. There are no shortcuts and no easy ways around this fact. However, each of these machines is more effective for helping along some goals more than others. Which means that you should opt for the machine that focuses closely on your goals to have an easier time with the already-difficult process. From total home gyms and traditional weights to cable machines and flexible rods, any one of these five products could give you the body you’ve been looking for. For your next big fitness purchase, consider the following options. Bowflex is a powerful name in home fitness. 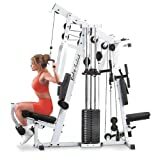 The brand's intuitive machines have helped with the popularization of flexible rods as means to provide weight resistance, and while the technology took a long time before becoming functional enough in the long-term, products like the PR1000 Home Gym are more than capable of improving your muscle tone, definition, and endurance. The Bowflex PR1000 Home Gym can perform up to 25 unique exercises that give you the means to work out just about every muscle group in the body. You can achieve up to 200 pounds of resistance using the flexible rods, which can be adjusted in fairly small increments. 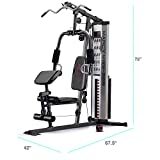 You can also transform this weight training device into a pseudo-rowing machine for quick workouts, and with the highly adjustable seat, most angles are a breeze to get into. 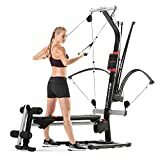 Unlike other products on our list, which tend to specialize in a specific goal or usage setting, this Bowflex product has just about everything. While the flexible rods will need to be replaced from time to time, other than that, we see little problem recommending this home gym to just about anyone. For a solid workout in a sturdy and reliable package, this Body-Solid machine seems to aim for bulking up and building muscle—and fast. The Body-Solid StrengthTech EXM2500S is a fully capable home gym like the Bowflex system. However, instead of flexible rods, the machine comes with stacked, weighted plates to provide resistance. There’s a particular focus on pecs and arms with this machine, so if you’re aiming to specifically focus on either group, this may be a great option for you. The price is high, and the range of workouts low comparatively, but given the lifetime warranty, Body-Solid ensures that no customer goes uncared for. 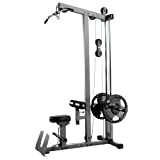 If you’re already working with a simple setup at home or have a few weights laying around, the bare-bones design of the XMark Lat Pulldown may be preferable to you. The XMark Lat Pulldown and Low Row Cable Machine is designed to be compatible with standard plates—as well as their Olympic variants. This means that you can seek out weights from just about any other source to get the specificity and range you need to use with this machine. This machine is essentially arm-only, which will be frustrating to some, but the focus on build quality and overall durability are considerably impressive. Plus, the price is low and adjustability high enough for you to share this product with other women and men in your life. We would have preferred more options for legs and core, but otherwise, we think this product offers a good way to tone and to build. While the previous product gave workout enthusiasts a one-way ticket to great arms, this product gives the lower half of the body its full attention. The Powertec Fitness Leg Press is exactly as it sounds—a standard slanted leg press that relies on gravity and weights to make sure nobody thinks you skipped leg day. This machine offers a ridiculous half-ton weight capacity, and the build quality and high-quality roller system are going to last quite a long time. However, it seems that the upper range of weights will be sold separately, and anyone hoping for more workouts in a home gym won’t be happy to see those features cut. Still, legs are important to many, and for those, this is a great addition to any home gym. The final product on our list is another all-in-one machine, but with a more conventional design and focus on joint stress reduction. The Marcy Multifunction Steel Home Gym uses plates instead of rods to get the job done and focuses on fully-utilizing the 150-pound weight limit across all major muscle groups of the body. Using lat bars, press arms, leg lifts, and bicep pads, you can focus on all major points of interest to get the definition you need. While this product isn’t a steal regarding price, it is clear that Marcy offers some sizable competition to the Bowflex brand. Not sure which product to aim for, or how to most effectively lose the weight and build the muscle? Check out our Buyer’s Guide for more information. While we think total home gym solutions like the Bowflex, Marcy, or Body-Solid units are going to be great for many, specialization may be key to getting your goals in order. That may also mean going for a different product than you may have expected or waiting to buy any product on our list altogether to get your weight in check before beginning your workout. In either case, we highly recommend you workout smarter, not harder. Always get the necessary nutrients to your body before the workout, and focus on working out consistently with rest days in between sessions. Your result will always be better if you take the time to get things right before starting out. Regardless of which product or program you set yourself off on, we hope that any one of these five products helps you achieve the body you’re looking for. With the right tools alongside you, weight lifting for women can be simple, fun, and most importantly, effective.